Make a reservation with us by phone or online. (The earlier the better.) We help you set a date and time as well as select rental gear. We deliver boats, boards, and gear to the beginning launch location. At the end of the trip, all you have to do is call us and we come back to pick up everything we dropped off, and you are free to go! 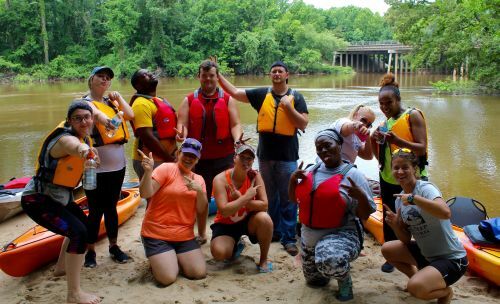 You can call us at (252) 714-5836, fill out the form on our website, or email us at kneedeepoutdooradventures@gmail.com to make your reservation. What is included in with rentals? Rentals include specified kayak or SUP board, paddle, lifejacket, and transportation of all equipment to and from the river. We also have medium dry boxes and large dry bags available to add-on for just $2-$3. Life jackets are required. They are the #1 way to stay safe in the water! We use MTI life jackets that are comfortable, designed for paddlesports and are washed after each use. The Personal Flotation Device (PFD, Life Jacket) we provide you will keep you afloat if you are wearing it properly. We give all first time paddlers a brief paddle lesson to every customer before sending him or her out to paddle. We have also taken the time (and money) to select some of the most stable and most comfortable kayaks on the market. We take pride in being a “beginner friendly” rental service. If you feel that you need more in-depth instruction we offer private lessons with one of our experienced staff members. We constantly monitor weather and will schedule our reservations accordingly. 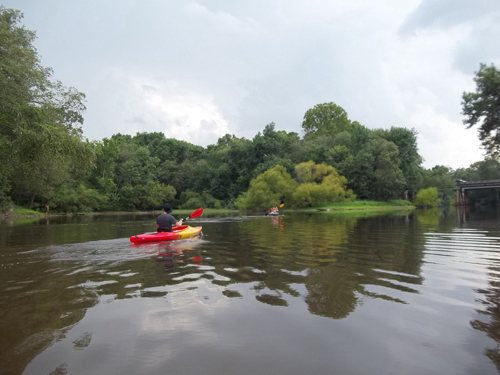 We will rent with chances of rain, but if there is lighting or the weather seems too severe for safe paddling we will gladly reschedule a paddle for you. If you are on the river and the weather turns bad, we encourage paddlers to find cover under bridges or in side creeks under heavy tree cover. What about snakes, spiders, and other dangerous animals? Do I have to sign a waiver? Why? The waiver simply informs participants that there are certain dangers involved with paddlesports and outdoor recreation that are outside of our control. This knowledge, combined with your consent, protects our business from being held responsible for these uncontrollable forces. This waiver also informs us of any allergies, existing injuries, or other relevant medical information that may assists us in providing safe adventures, and important information in case of emergencies. KDA is a dog friendly business! We simply ask that all dogs have current vaccinations and pose no danger to other people, or animals, throughout the duration of your time with us. We also ask that you ensure your dog has water, food, and any other necessary items. Feel free to bring fishing poles, picnics, coolers, etc. What if I return late from my paddle? Please notify us if you are running late! Quick response is crucial in emergency situations. If you are more than 30 minutes late and have not made contact with us, we will assume there is an emergency, and will send out a search team member. A $50 fee can be charged if we have to go out looking for you and there is no emergency, or reason for being late. Groups of 6 or more qualify for a 15% off discount. You can book a guided tour with one of our experienced and qualified guides. They will be able to educate participants on the local ecosystems, natural processes, and explain what Greenville and the surrounding area has to offer. They will also be able to provide assistance in emergency situations. This is a common misconception of many ‘brown’ colored waterways. The mud and sediment that floats and settles in the Tar River is the end product of a long natural chain of erosion. The brown color of the water is intensified by the amount of decomposing plant materials, such as leaves and bark. The effect is similar to the coloring of tea or coffee. Flooding and immediate runoff from large amounts of rainfall can temporarily affect the water quality of the Tar river due to its proximity to a large city like Greenville. We avoid putting people out on the river during these times. What wildlife might I see on the river? Where is Greenville Town Common Boat Access? Where is Port Terminal NC Wildlife Boat Access? What are the store hours and rental hours? Our store is open Thursday through Monday from 12am to 6pm. If you reserve ahead of time, we can get you out on the water earlier than 12am. Paddlers must return to the dock before the sun goes down. (6:30pm as of October 15, 2017) There are also rental options such 24, 48, 72 hours if you would like to travel to another destination (or go on an overnight trip). 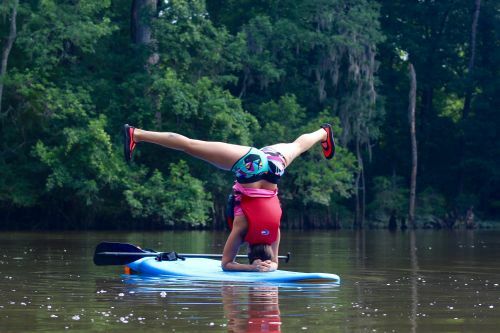 We carry a full line of kayak, paddleboard and outdoor equipment including paddles, clip-on pouches, travel pillows, life jackets, first aid kits, survival packs, hammocks, kayak anchor kits and RV-Tents.